Healthy blood circulation is an integral part of healthy living because blood works similar to gasoline in a car. When your car is lacking gasoline, it cannot run, or if there is a problem with the car preventing the gasoline from getting to the engine, it will not run as efficiently as it normally would. This same concept applies to blood circulation. Every part of our body requires oxygenated blood to function, so if there is a blockage, damage, or something else preventing this steady flow of blood from reaching all parts of the body, your health can take a hit. Diet can play a role in healthy veins and arteries. The main goal of eating for circulatory health is to remove saturated and trans-fats, salts and sugars, and processed and junk foods. These foods can contribute to plaque build-up and cholesterol, which can cause stiffening, hardening, and narrowing of arteries, which slows down blood flow. The types of foods that you should avoid include packaged goods, baked goods, biscuits, refined carbohydrates like white bread or pasta, pastries, ice cream, processed meat, and full-fat dairy. 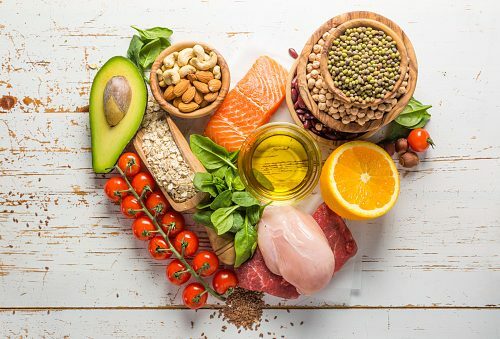 Oily fish: There are many essential fatty acids and other nutrients found in fatty fish—and some nuts and seeds—that work to improve the circulatory system. Some studies have found consumption of fatty fish can lower blood triglyceride levels, help prevent blood clots, help regulate heart rhythm, and boost the lining of blood vessels and functioning. Dark chocolate: Flavanols in dark chocolate have been shown to protect LDL cholesterol from oxidization, which increases the risk of clogging arterial walls. Flavanols also make blood less sticky, which reduces the chances of it sticking against the arteries. Watermelon: Watermelons are high in nutrients. which may prevent plaque buildup. Pumpkin seeds: Pumpkin seeds have been shown to reduce cholesterol levels. which reduces the risk of heart disease. Garlic: Studies have shown that garlic reduces blood stickiness and lowers high cholesterol while protecting against atherosclerosis and plaque buildup. Leafy greens: Nutrients in leafy greens help dilate blood vessels, meaning they are wider, so more blood can pass through them. Citrus fruits: Antioxidants found in citrus fruits help prevent the oxidization of cholesterol. Celery: Celery is high in potassium, which works to lower blood pressure. By incorporating these foods into your daily life, you can work to improve your vascular health and ensure you are reducing your risk of heart disease and stroke.